Mansouri, G., Mansouri, M. (2018). Synthesis and Characterization of Co-Mn Nanocatalyst Prepared by Thermal Decomposition for Fischer-Tropsch Reaction. Iranian Journal of Chemistry and Chemical Engineering (IJCCE), 37(3), 1-9. Ghobad Mansouri; Mohsen Mansouri. "Synthesis and Characterization of Co-Mn Nanocatalyst Prepared by Thermal Decomposition for Fischer-Tropsch Reaction". 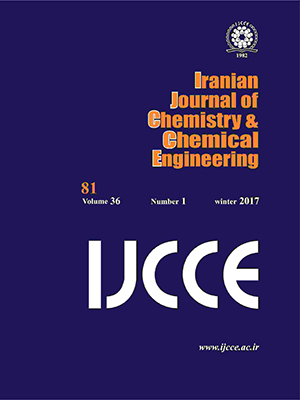 Iranian Journal of Chemistry and Chemical Engineering (IJCCE), 37, 3, 2018, 1-9. Mansouri, G., Mansouri, M. (2018). 'Synthesis and Characterization of Co-Mn Nanocatalyst Prepared by Thermal Decomposition for Fischer-Tropsch Reaction', Iranian Journal of Chemistry and Chemical Engineering (IJCCE), 37(3), pp. 1-9. Mansouri, G., Mansouri, M. Synthesis and Characterization of Co-Mn Nanocatalyst Prepared by Thermal Decomposition for Fischer-Tropsch Reaction. Iranian Journal of Chemistry and Chemical Engineering (IJCCE), 2018; 37(3): 1-9. Nano-structure of Co–Mn spinel oxide was prepared by thermal decomposition method using [Co(NH3)4CO3]MnO4 as the precursor. The properties of the synthesized material were characterized by X-Ray Diffraction (XRD), Brunauer-Emmett-Teller (BET), Transmission Electron Microscopy (TEM), surface area measurements, Energy-Dispersive X-ray (EDX) spectroscopy analysis, UV-Vis spectrophotometer (UV-Vis), Fourier Transform InfraRed (FT-IR), Thermal Gravimetric Analysis (TGA) and Differential Scanning Calorimetry (DSC) analyses. The results show that Co–Mn spinel oxide is spherical in shape and possess crystallite size is about 12 nm. The catalytic activity and product selectivity were also investigated, in a micro-reactor (Fischer–Tropsch Synthesis (FTS) reaction) and the results compared with conventional Co-Mn oxide catalyst. The catalyst performance increased as the particle size of the catalyst decreased. Moreover, the olefin to paraffin ratios was increased, compared to the conventional catalyst.
. Mirzaei A.A., Habibpour R., Kashi E., Preparation and Optimization of Mixed Iron Cobalt Oxide Catalysts for Conversion of Synthesis Gas to Light Olefins, Appl. Catal. A Gen., 296: 222-231 (2005). Park J.Y., Lee Y.J., Karandikar P.R., Jun K.W., Ha K.S., Park H.G., Fischer–Tropsch Catalysts Deposited with Size-Controlled Co3O4 Nanocrystals: Effect of Co Particle Size on Catalytic Activity and Stability, Appl. Catal. A Gen., 411–412: 15-23 (2012). Zeng B., Hou B., Jia L., Li D., Sun Y., Fischer–Tropsch Synthesis over Different Structured Catalysts: The Effect of Silica Coating onto Nanoparticles, J. Mol. Catal. A Chem., 379:263-268 (2013). Farzad S., Haghtalab A., Rashidi A., Comprehensive Study of Nanostructured Supports with High Surface Area for Fischer-Tropsch Synthesis, J. Energy Chem., 22: 573-581 (2013).